Vintage Old Postal Stationery Card Postcard 5c. With Overprinted in black : Est Africain Allemand Occupation Belge. Duitsch Oost Afrika Belcische Bezetting. German East Africa. P.S.C. PSC. 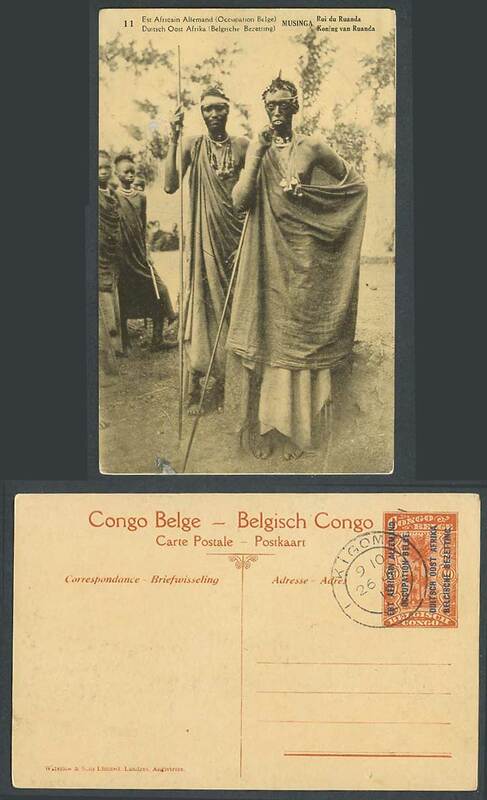 Africa Belgian Congo Belge - Belgisch Kongo. Est Africain Allemand (Occupation Belge. Duitsch Oost Afrika (Belgische Bezetting) Musinga, Roi du Ruanda. Koning van Ruanda. Ethnic Life. African Royalty. Black Women. Costumes. Kigoma 26 JA 18. 1918 Postmark.